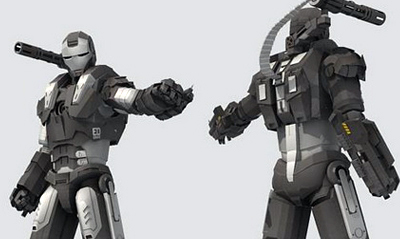 War Machine is proof a suit of armour is only as strong as the person behind it. More than a Crimson Dynamo, James Rhodes' best get-up could be made of styrofoam and he'd still be the badest dude in town. Illustrating, or should I say folding that point into perspective is Suraj S. Prakash. 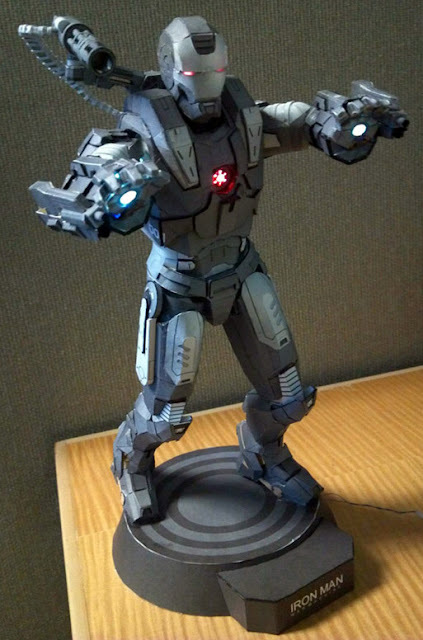 A man who used photos of War Machine from the net along with software packages 3D Studio Max 7 and Pepakura Designer, to create this 1/6 scale War Machine paper model. Taking three months to complete and a fiber optic LED system, I don't think I'll be looking at the office A4 the same way again. For more photos click the jump. Now that's some dedication and hardwork right there! Mad props to that guy for putting in many, many hours(not to mention frustration) it took to make this. Sure does Dale! For some reason when I saw this I hoped the next inline would be Darkseid with his big glowing eyes, but those New Gods need a better agent first. A Darkseid one of these would be pretty cool Dan. Maybe you can make a request.